I'm laying low today...my daughter has so graciously shared her cold virus with me...isn't that sweet? No studio work today, ~cough, sniffle, hack~. Above is another shot from my modest studio. A pic of a drawer with engravers, scrapers, burnishers, and steel square, a drawing plate, a ring vise, and other yummy steel things housed in boxes. If I can get my old, sick body is gear tomorrow, I'll be listing this ring and a couple other pieces in my Etsy shop. 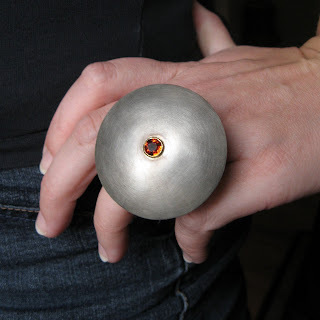 The 'bigger than big' ring is hollow, saucer shaped nickel silver with a spessartite (orange garnet). OK, off to cozy up to some hot tea! Very cool ring...it's fun to get a sneak preview before you list it on Etsy. Hope you & your little one feel better. Tea is a good idea.